Irish-born Major Connor Forbes discovers he inherited an English dukedom. He suspects someone is trying to eradicate his family line. Conner is uncomfortable in his new role of Duke, especially with his peer’s lackluster welcome due to his heritage. A beautiful debutante comes to his home to plead for her dandified beau’s life. He decides to use Lady Maggie’s knowledge of the ton to ferret out his would-be killer. Can Connor unearth the real reason behind his kinsmen’s death? Will his skillset be enough to protect Maggie from the threat dodging his every step? Lady Margaret “Maggie” Winthrop desperately wants to marry, so she can escape her sister’s household. When her only suitor challenges the new Duke of Amberley, she persuades Connor to spare the coxcomb. Maggie helps him navigate the Ton by introducing him to a few of her influential friends. She decides to aid Connor in his hunt for the fiend threatening his life. The Irish rascal tempts Maggie to become more adventurous and naughty. However, past secrets are exposed when the threat strikes too close to home. Will those secrets prevent their future together? I love the fact that Connor is three-quarters Irish. He is such a rascally and devilish man. Connor tries valiantly to integrate into his new life as civilian and duke; however, he cannot seem to let go of his army upbringing. I adore how Maggie’s calm presence soothes the inner turmoil he experiences from his stint in the war. I like how altruistically she helps Connor find his footing among his new peers. But what I love the most about Connor is how he influences Maggie to embrace and explore her hidden naughty side. Maggie pleasantly surprised me. She starts out as an unassuming woman, but Connor influences Maggie to break free from that shell. I adore how she cares nothing about Connor’s Irish heritage but accepts the rascal for who he is. He emboldens Maggie to finally stand up against her sister’s snide tyranny. I like how despite Delia’s past mistreatment, Maggie willingly defends her sister against the First Duchess of Amberley’s verbal cruelty. I understand Maggie’s initial discomfiture at witnessing Connor’s violent side first-hand; however, I feel as if she should have anticipated that part of his nature related to his war experience. 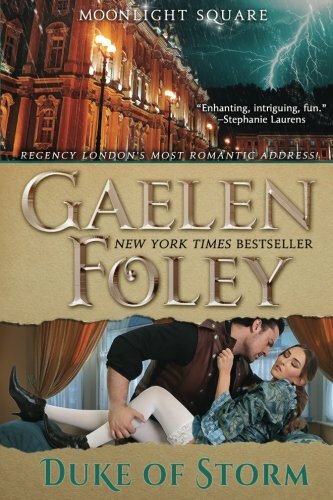 DUKE OF STORM is book three in Gaelen Foley’s historical romance series, MOONLIGHT SQUARE. I always enjoy it when an author lets couples from prior books play important and active roles in their latest story. It is a delight to see how these characters’ lives progress even after their book. I also like the two side romances happening in this story’s background. DUKE OF STORM is an exciting romance filled with humor, action, and adventurous mystery. I cannot wait to learn more about Portia Tennesley and her mysterious, intellectual Duke. Also, I hope the author plans to write a book for Major Peter Carvel soon.